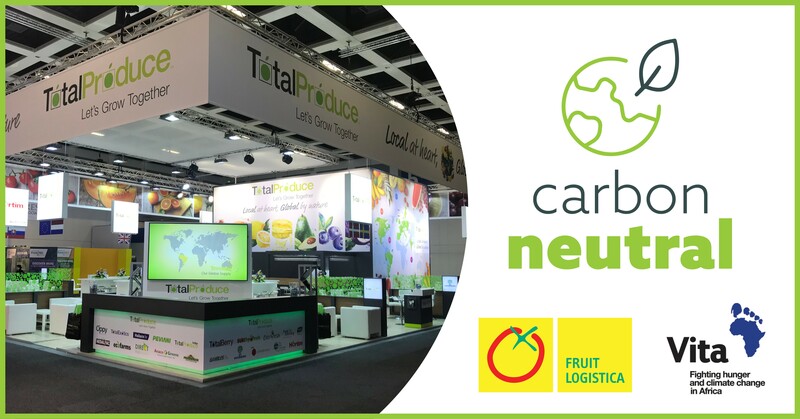 Total Produce is pleased to confirm that, for the first time, the group’s participation at Fruit Logistica will be Carbon Neutral. In association with Vita, an Irish development partner working with communities in Africa to fight hunger and climate change, Total Produce has committed to offset carbon emissions associated with exhibiting in, and travelling to, the Messe Berlin by investing in Carbon Credits. This initiative will see Vita independently calculate and total the estimated carbon emissions associated with the construction and operation of the Total Produce stand, long haul and short haul travel to the event and accommodation for all Total Produce attendees. Total Produce has committed to invest in Carbon Credits to the value of the total tonnage of CO2 emissions estimated by Vita, the revenue from which will fund Vita projects to provide water pumps and stoves dedicated to bringing clean water to communities in Africa while reducing wood burning, water borne disease and needless drudgery for African women and children. Removing as it does the need for many additional trips to growers, customers and sister companies throughout the year, for Total Produce, Fruit Logistica is, in of itself, already an instrument for reducing international travel- and by extension the Group’s carbon emissions. Vincent Dolan, Group Marketing Director adds: “In working with Vita, we in Total Produce are striving to reduce still further the impact of carbon emissions associated with unavoidable travel across a global group while simultaneously contributing to worthwhile carbon reduction and water preservation projects in Africa. Total Produce’s stand at Fruit Logistica 2019 will be located in Hall 5.2 on Stand A-06 in the Messe Berlin.